Today, August 1, is Lammas - the festival to celebrate the start of the harvest in the Pagan Wheel of the Year. 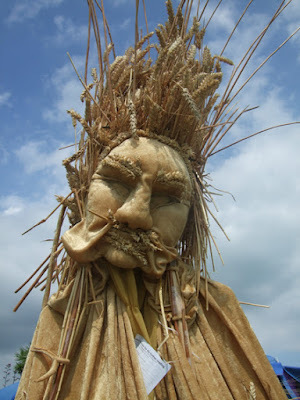 I took this picture of the Corn King at Eastbourne Lammas Festival a few years ago. I wasn't able to get to the event this year as I am away on holiday in another part of the UK. I'm staying somewhere with limited internet access, so all week I have been sharing some photos that bring back old holiday memories for me. The start of the harvest isn't just a time to celebrate grain being brought in from the fields. Lammas is also a time to think about all the joys and successes we have had in our own lives. I think looking back at happy memories is part of that. When I get back from my current holiday I hope to share a photo or two that I've taken while I am away. I wish everyone a wonderful Lammas and the blessings of a good harvest. I hope the rest of the summer brings you all that you desire.